November is National Adoption Month, join us as we talk to Mark & Nicole Saylor and learn more about their story. How many kids have you adopted so far and from where? How old were they when you adopted them? Tell us a little about each one and their personality. Savannah (13, adopted at birth) A vibrant, creative girl who loves to dance. She is very nurturing and responsible with Daniel and other young children. Daniel (4, adopted at one month old) He is silly, playful, and imaginative. We adopted Savannah because we desperately wanted children, but had experienced years of miscarriages and infertility. God gradually worked in our hearts and minds to show us how our desire to be parents could be used to help children in foster care. We believe firmly that God cares deeply for all children and desires for them to be in permanent, loving families. We became certified to be foster parents, but surprisingly became pregnant with Juliana, and then again with Melody. When Melody was a few months old, we began hosting children in our home through Safe Families for Children. This is an "orphan prevention" program where families in crisis get help with housing, job hunting, etc. while their children live with volunteer host families. We hosted 15 children over a period of 3 years. During that time, we learned about the need for adoptive families for medically fragile and terminally ill infants. 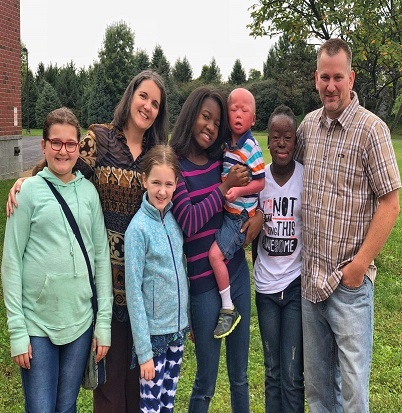 Daniel was placed with us within just a few weeks of the completion of our adoption home study. After Daniel's adoption, we did not intend to adopt again. But a new adoption worker began advocating for Cristian. One of her first steps was to contact FIRST, who then contacted us to see if we wanted to help advocate for Cristian. Advocating for him eventually turned into us adopting him! All adoptions begin with loss: loss of a birth family, perhaps loss of foster parents, perhaps loss of a stable early childhood, perhaps loss of a healthy uterine environment. Because these losses affect the children's brain development, the whole family is affected. It is not an easy road, but we think it is totally worth it. The opportunity to parent three extra amazing kids! We have also seen our faith strengthened through each of these adoptions and the challenges that surround them; whether they are financial, emotional, physical, or any one of a number of others. No matter what we've faced God has carried us through. We have met so many great people in the adoption world. We have been stretched to become better parents because of the extra challenges that come with parenting adopted children. Well, we have no plans to adopt more children. But we've said that before. We wish we had known just how hard adoption is on a child...even one adopted in infancy. It wouldn't have changed our desire to adopt, but might have led us to seek out different parenting resources earlier. Older child adoption is hard...really, really hard. It is hard on the child, the pre-existing siblings, and the parents. But we were well-prepared, having watched Mark's brother and his wife adopt our niece from China (she also has ichthyosis! ), and having read books and talked with other adoptive parents. We spend so much of our time right now working on family bonding...there's very little time for anything extra outside of working, eating, and sleeping. How challenging has the language barrier been with you and Cristian? How have you been teaching him English? And how have you been communicating? The language barrier is no big deal in everyday situations. We both know some basic Spanish, and he is learning English quickly just by being immersed in our family. The most difficult aspect of the language barrier is when we need to have heart-level discussions. We rely heavily on Google Translate in those situations. We gather every year with the whole family at Mark's brother’s home for Thanksgiving, it's a blast for all the cousins, and all the adults as well, to be in one place giving thanks together for all we've been given. We love putting up the Christmas tree on the Sunday after Thanksgiving. We also love having movie nights and we enjoy swimming together on vacation. We read to the kids almost every night, which is a wonderfully relaxing way to end the day. Since November is National Adoption Month, who could adopt (Do you have to make a certain amount of money, or have a certain job or specific requirements)? Most people with a clean criminal record can adopt. Age, financial, and health restrictions vary widely depending on domestic U.S. adoption or international adoption. Talk to other people who have adopted. That really is the best way to decide if it's for you. U.S. citizens can adopt from the U.S. foster care system for no cost at all. In fact, the child will likely receive a monthly subsidy which helps to pay for day care, food, clothing, etc. No matter which kind of adoption you pursue (domestic private, domestic foster care, international), the process starts with a home study. The home study is a process which involves lots of background checks, paperwork, essays, education classes, and a home visit by a social worker. After the home study, the process changes depending on which type of adoption is being pursued. Expect lots of paperwork. Lots and lots of paperwork. What was it like to actually be in Cristian's home country and culture? What made you decide to bring the girls along and what did they think of the experience? We LOVED being in Colombia for almost a month! It was so valuable to us to experience the food, the people, the language, and the climate of his home city and country. We decided to bring the girls along to give them an amazing international experience, and to help with family bonding right from the beginning of the adoption. We missed Daniel a lot, but he was in capable hands with his grandparents and his nurses. Will you tell any of your kids about their adoption later on in life? Do you have any information or stay in contact with their birth parents? We have been open with our children about their adoptions since the very beginning. Savannah has an open adoption, where we communicate frequently with her birth family. Daniel's adoption is also open, though we have thus far had limited contact with his biological family. Open adoption can be messy and complicated, but for us, it has been beautiful and worth the effort. Cristian has a strong bond with his Colombian foster family, so he has regular phone calls and email contact with them. What made you decide to go with a kid with special needs? Because it is impressive that you willingly adopted not one, but two children with ichthyosis! We believe strongly in the God given value of all life...ESPECIALLY the value of children born with differences. Before we adopted Daniel, our eyes were opened to the need for adoptive parents of infants with life-threatening or uncertain diagnoses. Many of these babies go into foster care instead of into a permanent family. Special needs infant adoption was a great marriage of our values and our desire to have another child. We didn't know ANYTHING about ichthyosis before we heard about Daniel from our social worker. We did a few hours of internet research on "harlequin ichthyosis" and decided to say "yes". It's been a steep learning curve, but we have been very well-supported in the journey to care for Daniel. And once you have one child with ichthyosis, adding another one (especially one who can put on his own creams already!) doesn't seem so daunting. Do you have other children? What do they think of their adopted siblings? Yes, we have two biological children: Juliana, age 10, and Melody, age 8. Having adopted siblings is all they have ever known, so they don't think it's anything all that special. What were the challenges of adopting an infant (like Daniel) vs. a preteen (like Cristian)? Daniel was very medically fragile for the first six months. That was a real stress on the whole family, but we also got to experience all the milestones like first smile, first words, first steps, etc. Adopting an older child is a whole different experience because he already has a value system, a culture, and a history that does not include us. So we have to meet him where he already is and patiently guide and mentor him as he approaches adulthood.